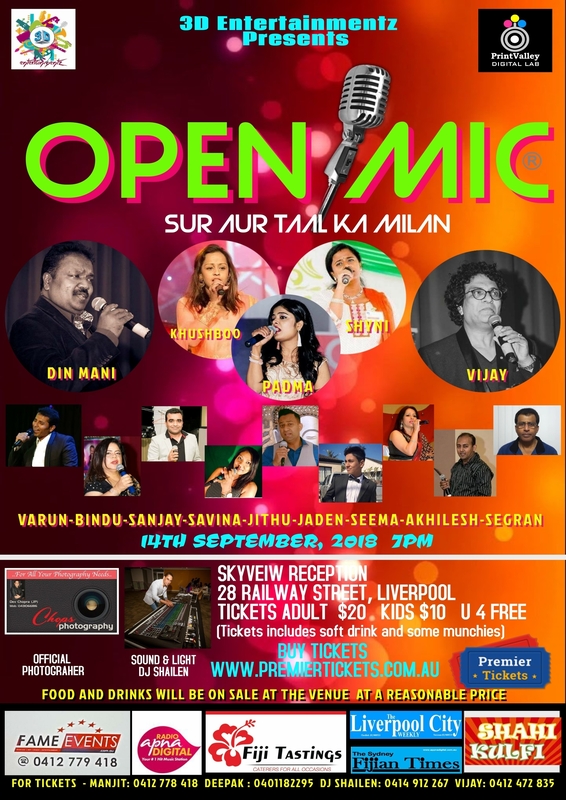 3D Entertainmentz cordially invites you and your friends to attend the OPEN MIC – Sur Aur Taal Ka Milan. A very warm welcome to one and all !! Want to enjoy live music? For Open Mic 2018 we have chosen a bunch of awesome emerging Sydney artists who we think you need to know about. It’s a multicultural event so get your family, friends & work mates to spend some fun time with them. Many more entertaining and happening things will be waiting for you…!!! Your support is much appreciated!! 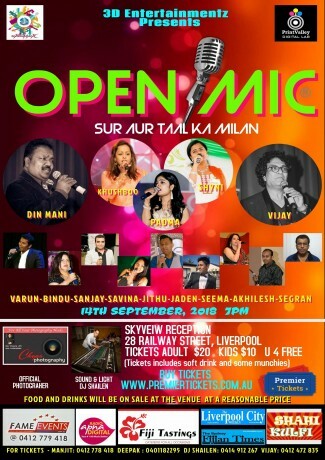 Premier Tickets is proud to be the online ticketing partner for the event !! Please bring print out of ticket confirmation with you. Premier Tickets is an online event marketing and ticketing agency. Premier Tickets will NOT be responsible for any changes related to the event schedule, artist, venue or cancellation and refunds related to the tickets for this event. Event Organiser has all the rights to alter and/or modify and/or add seating arrangements based on the demand and availability of the space. In case of any misbehavior/misconduct by any person at the venue, Event Organiser has all the rights to evict that person from the auditorium and no refund will be given. Ticket availability and prices declared/quoted are subject to the change at the discretion of the event organizer without any notice. Hindu council of Australia used Premier tickets for the one of the biggest community event in Sydney and had fantastic experience. First release of promotional tickets (1400) were booked withing 24 hours. With even limited online promotion we were able to book 3000 tickets through Premier tickets. The complete ticketing solution by Premier ticket for our event was great and we will use it in future to make it completely online ticketed event.